We've seen pop-up shops, now, for the premiere of the new Banksy film 'Exit Through The Gift Shop', London has a pop-up cinema underneath Waterloo station! 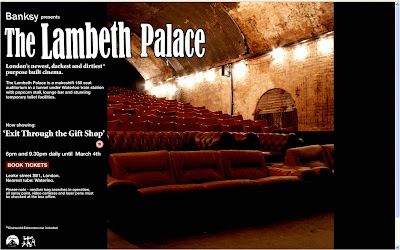 Screenings of 'Exit Through The Gift Shop' will run until 4th March when the Banksy film gets full UK release. Film viewers are also apparently given a can of spray paint as a leaving gift!